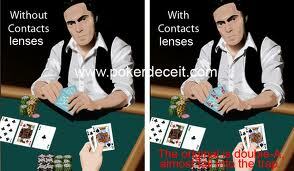 Major Italian/French Poker and Casino Cheat Team Busted in France For Infrared Poker Cardmarking Scam Using Contact Lenses! Three Italian poker players and two employees of southern French casinos were in custody Thursday, accused of netting thousands of euros in a high-tech gambling scam that involved marking cards with infrared ink. The scam allegedly involved marking each of the cards in a pack with ink visible only when wearing infrared glasses, then planting the pack at a poker table in Cannes, Le Parisien reported. The players then turned up to play wearing infrared glasses so they could see the marks. "In a way, these players saw through the cards," a judicial source said. I have much experience in this sort of scam and wrote about it in detail in both my books "American Roulette," ("Grand Casino Heist" in the UK) and "Dirty Poker." Although this particular card-marking poker cheat scam didn't use the ultra-modern laser card-markers, they seemed to have gotten the job done. I don't know how they got caught, so there must be something more to this than is mentioned in the following article. Two French casino employees were arrested in this poker cheat scam with a group of Italians. Well, it's nice to see a major poker cheat scam go down without it being pulled off by Asian Cheats for a change. For those of you who were around some thirty or forty years ago, the Italians, right behind the Americans, were the biggest organized casino cheats in the world. Police became suspicious when the gang pocketed around $60,400 at a swanky casino in Cannes in August and set up a device to intercept them the next time they visited. During their next visit to Les Princes des Cannes casino, the three Italians won about $27,460 but were stopped in the casino hallway as they tried to leave and were arrested. An employee from the casino also was arrested, along with a member of staff from a casino in Nice. The three Italian players were "linked to serious organized crime," according to the newspaper. Investigators were sending details of the trio to all casinos in Europe in case they used the same scam elsewhere.